Photography by Andrew Latreille. Written by Sandra Tan. This article originally appeared in AR146 – available now through newsstands and digitally through Zinio. 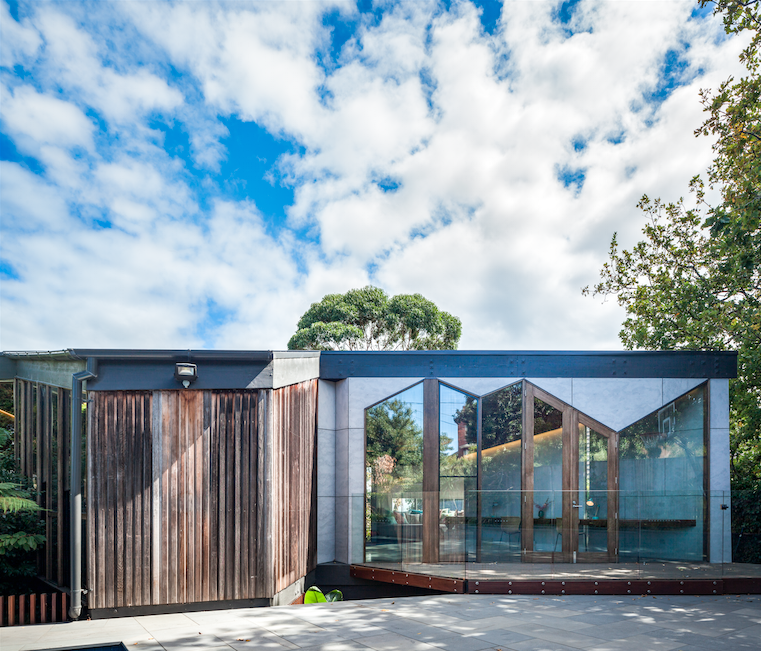 Sandra Tan: How did the Chamfer House project come to your practice? Mihaly Slocombe: The project enquiry for Chamfer House was five years in the making. Our first built project, Hill House, was completed in 2006 and longlisted two years later in the WAN House of the Year Awards. This caught the attention of a scout for the Canadian television program, World’s Greenest Homes. In 2009, Hill House appeared on the show, which was aired a few times on the ABC. Our clients, Faith and Rohan, watched one of the repeats, tracked us down and in 2011 commissioned us. The amazing thing is we had almost no control over many of the steps in the process! This is proof that serendipity plays an enormous part in the success of any architecture practice. How involved was the client from the initial conceptual stages and throughout the design process? Faith and Rohan were ideal clients in pretty much every way. They were closely involved throughout the design, but never overbearing. They were supportive and decisive, emotionally connected to our design work, and trusting of our expertise. What were the key points of inspiration behind the design? Without doubt, our central inspiration was Kevin Borland’s own design philosophy. We devoured a great monograph on his life, Architecture from the Heart by Doug Evans, and learned all we could about his approach to architecture. We were very conscious of engaging with the existing house in as sensitive a way as possible. This aspiration was shared by Faith and Rohan, who bought the house in the first place because they loved its personality. Evans wrote that, “Kevin Borland’s mature domestic style combined absolute structural rationality with materials and detailing of great romantic warmth and informality.” We used this understanding to drive our intervention, which assumed a strategy of sensitive infiltration. We touched every room, some more heavily than others, yet retained the house’s core personality. How does the project complement and incorporate the local design language? Olivers Hill, where Chamfer House is located, is a crucible of late modernism. 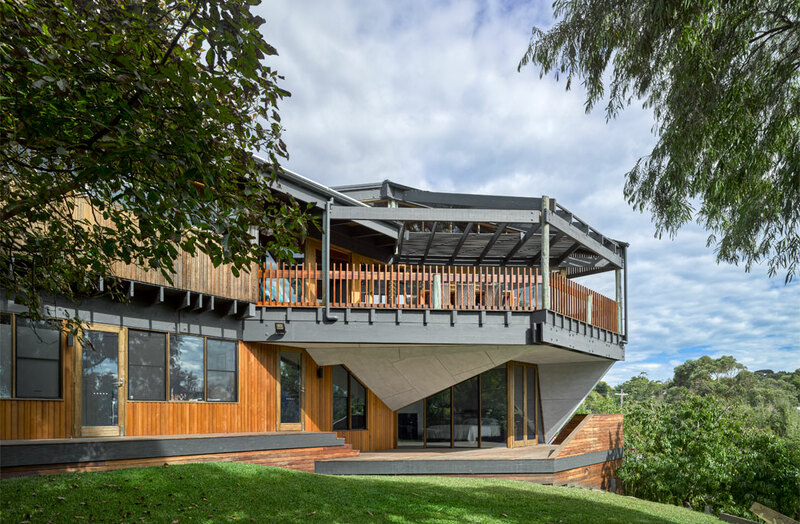 There are a number of houses by Robin Boyd, Chancellor and Patrick, Daryl Jackson and, of course, Kevin Borland. The design cues of this era directly influenced our work, in particular the celebration of the much loved 1970s chamfer! Last year, the local council undertook a comprehensive study of postwar modernist houses. They analysed the importance and intactness of the originals in order to recommend Heritage protection where appropriate. We were pleased to discover that Chamfer House received an individual Heritage citation, with our contributions to the building noted for their sensitivity to Borland’s original fabric. Our interest in Kevin Borland’s architectural approach took expression in our work via a lens of interpretation and transformation. We absolutely didn’t want to replicate his design, this would have devalued both Borland’s work and our own. Instead, we wanted to rethink his ideas for a new client, new lifestyle values and new era. An example of this is our explosion of the chamfer into three dimensions. 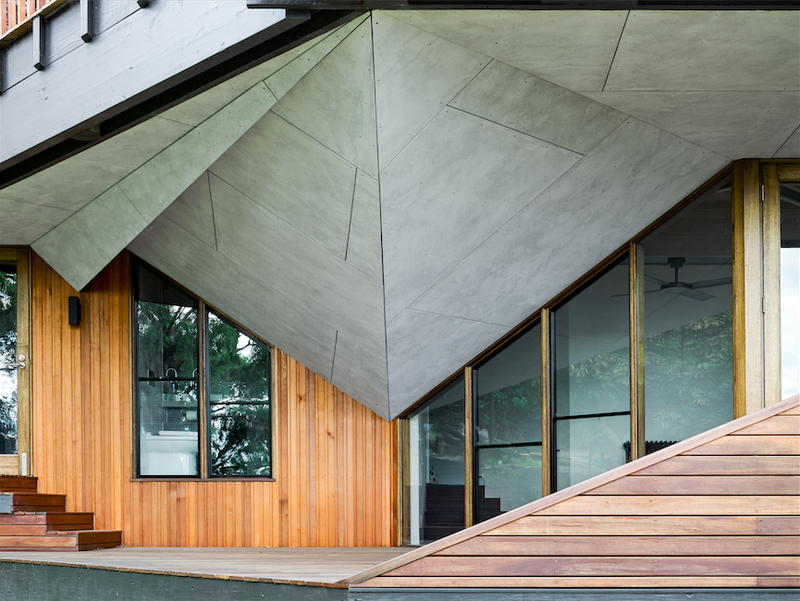 In the children’s living room upstairs and outside the master bedroom, the chamfer is expressed as a faceted series of cement sheet surfaces. In the living room the facets mark the relationship between old wall positions and new, and outside the master bedroom they conceal a steel structure to support the balcony above. We were always worried about the integration of new and old in this project. With regular renovations, there’s usually a clear delineation at some point in the house – where the original house ends and the new works begin. For Chamfer House, our works touch every room. There isn’t one transition point, but many. Our goal was a seamless transition with moments of particular celebration. We think we achieved this, and are stoked with the result. Chamfer House revisits a post and beam dwelling designed in 1977 by Kevin Borland, the Hildebrand House. It sits within an established garden on Olivers Hill, a crucible of late modernism overlooking Port Phillip Bay. Our clients approached us soon after moving in. 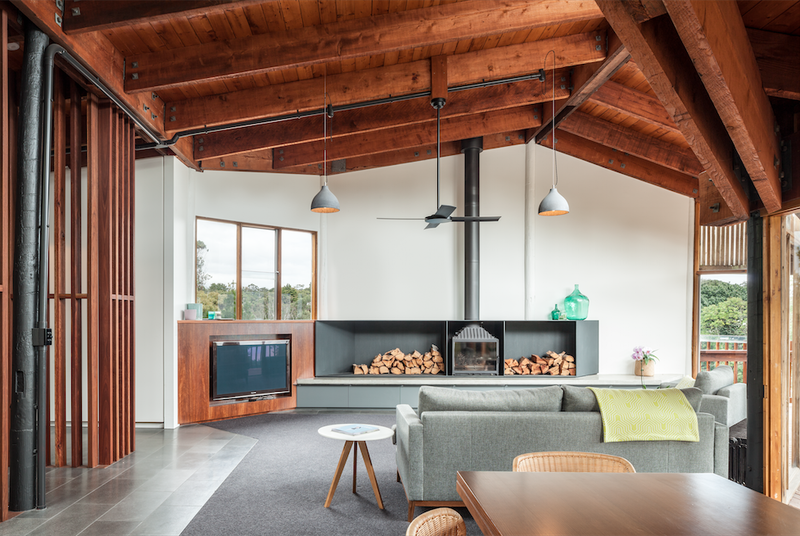 They wanted to protect the timber ceilings, exposed Oregon structure and finger-jointed window frames they loved, while also updating the house to suit their young family. Our intervention assumed a strategy of sensitive infiltration. We touched every room, some more heavily than others, yet retained the house’s core personality: the romantic rationalism that characterised much of Borland’s later work. We unkinked the plan, pulled back a touch on the 1970s psychedelics, and reconfigured the living and sleeping areas to better connect with the garden. In his monograph on Borland, Doug Evans notes that his “mature domestic style combines absolute structural rationality with materials and detailing of great romantic warmth and informality”. We sought to build on this juxtaposition, layering a rational spatial sequence with an exploded interpretation of the chamfer. A device used regularly by Borland and on Hildebrand House only in plan, the chamfer we developed into a three-dimensional form that operates from the macro scale to the micro. 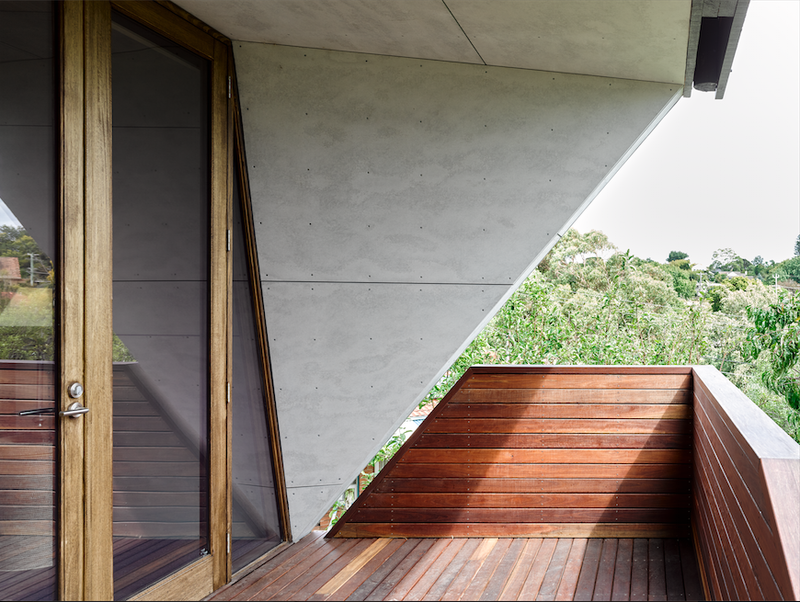 The faceted balcony soffit framing the view from the master bedroom is one example, as are the repetitive triangular motifs in our customised joinery hardware. Chamfer House adheres strictly to the five- by five-metre grid of the original. The trimming and extending of corners deliberately interrupt the grid, but are very much a part of its pattern. Family life radiates from the kitchen, which straddles a full grid segment at the heart of the house. Our clients’ children have made the second living room their own, occupying a triangular bookend every afternoon for homework before LEGO and play. These moments are an extension of the deep humanity of Borland’s work: the plan is aligned to the view, the sun and the garden; rooms are sized to suit the dimensions of living; triangular pockets provide looseness and intimacy. This article originally appeared in AR146 – available now through newsstands and digitally through Zinio. Stay tuned for Sandra Tan’s interview with the emerging practice on ADR in weeks to come.